I had the opportunity of meeting and speaking with Ken Hammel during the Yankee Sportsman’s Classic, January 18th through 20th, where Ken was both a seminar speaker and a vendor. Ken’s seminar topic was “Trophy Whitetail Calling Tactics.” While his company sells a variety of products, including deer grunt tubes, deer scents and lures, and de-scenting soaps, Ken’s presentation focused on rattling for deer. Ken’s talk was definitely focused on helping hunters rather than selling product. The major take-away from Ken’s presentation was that if you hunt in the Northeast, you need to rattle for at least a half hour. Rattle for about three minutes, then wait and listen…repeat. Ken suggests continuing rattling because it may take time for a buck to locate the source of sound, especially with hilly topography. During his presentation, he mentioned that some hunters cut off the brow tines on their rattling antlers so they don’t hit their thumbs when rattling. Ken, however, is a firm believer in keeping as much antler as possible to make the most noise, an occasional thumb whack, notwithstanding. I don’t think that using too much antler mass or too-long brow tines are much of an issue for local hunters using Vermont deer antlers. A doe rarely comes to a buck call, but will usually respond to a doe call. Ken’s company, Mountain Hollow Game Calls, is just over 30 years old. The company was originally started by Ronnie Johnson and was taken over by Ken when Ronnie left. Ken says they produce about 10,000 calls a month. He is assisted in his business by many people, including about 10 family members, such as his mom, who assembles the lanyards. His late father had also assisted in making the lanyards. When I asked Ken what he likes most about his business he said he likes designing and building the calls. 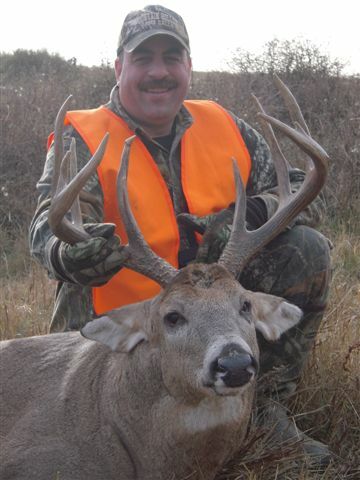 He describes Mountain Hollow Game Calls as a very friendly company that likes teaching people. They have a Pro Staff of about 40 and want to teach you to be successful. From talking with Ken and listening to him talk with people he knew at the show, it seems that Ken also enjoys a fair amount of hunting. Ken said the least enjoyable part of the job was selling. Ken said he attends 14 to 16 sportsmen shows a year, the largest of which is the show in Harrisburg, PA (recently cancelled due to a vendor boycott following the promoter’s ban of modern sporting rifles). While he sells his products through stores and on the internet, Ken says that the best deals he offers are at shows. I want to thank Ken for taking the time to talk with me and answer my questions. Ken is an interesting guy with great company…and a seemingly very tolerant wife. If, during the night, you hear a sick sounding Barred owl followed by a dog’s howl, don’t be alarmed, it’s probably just me. *After hearing some of Ken’s stories I would love to meet his wife. As I mentioned above, Ken is refreshingly candid. He asks the audience if anyone has ever been lost in the woods. A few honest men raise their hands. Ken volunteers that he’s been lost. In fact, he adds, over 200 men were once out looking for him. His wife said he could never hunt again…that didn’t work. My favorite story came when we were discussing using mouth calls – the diaphragm-type calls that fit in your mouth. Ken said that the first time he tried one of these calls (remember, these are a staple sale of his company) he gagged and threw up. Once again, his wife said, you aren’t doing that again…and, once again, that didn’t work. Ken says he can now keep several of the calls in his mouth at the same time and just rotate them as needed. When I comment on what a great story this is, Ken quickly points out that it is impossible to actually choke on any of the mouth calls.